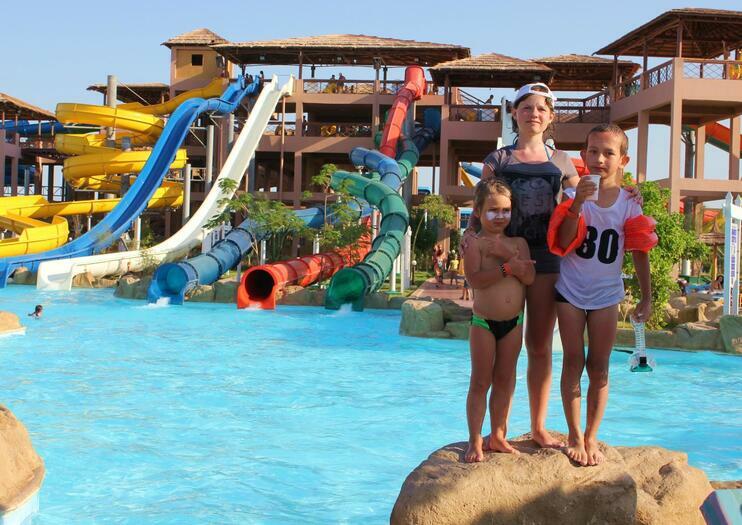 This beachfront water park in Hurgada is a favorite for many families visiting the area. With 46 different water slides, a wave pool, water cannons, a wave simulator for surfing, waterfalls throughout and the turquoise ocean merely steps away, there are dozens of ways to enjoy the water. Brightly colored themed structures provide ways to stay cool while climbing and playing in the freshwater. Palm trees create shade in a lagoon area for when it’s time to relax. There is also a lounge area facing the sea on the hotel’s private beach, seven large pools (three of which are freeform,) or the option to stay in the water and float along in one of the many inner tubes. Water slides range from small and slow to extreme and fast, the largest of which is a 19-meter free fall slide. There are also supervised smaller pools designated for children. The Makadi Water World water park is located at the Sunwing Makadi Hotel on the north side of Makadi Bay, about 15.5 miles (25 km) from the airport and 22 miles (35 km) from the town of Hurghada. Open from 10am to 5pm, admission fees are 30 Euros (270 Egyptian Pounds) for adults, and 15 Euros (135 Egyptian Pounds) for children ages 4–11. Entrance to the water park includes food and drinks.